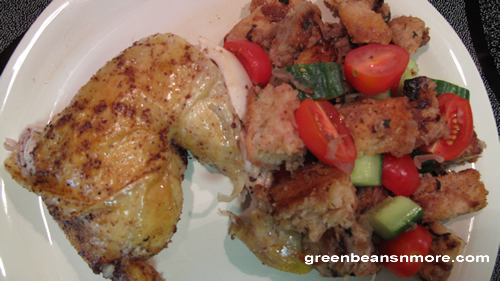 When I saw this recipe for Sumac Chicken and Bread Salad on Chowhound I knew I had to try it. Sumac spice is found in Persian recipes. Most people aren't familiar with it. Ground sumac is sometimes called "powdered culinary sumac". It has a tart sour lemon flavor and a dark burgundy color. This is a perfect summertime dish and excellent for entertaining family and friends. It's flavorful and light. The chicken is flattened and marinated in a sumac paste. It is then baked over the bread. The skin of the chicken becomes crisp and the chicken wonderfully flavored with the sumac. Some of the bread becomes soft from the juices of the chicken, some remain hard. The bread becomes what my friend called the "ultimate croutons" when fresh tomatoes and cucumber are added. Cut the back bone out of the chicken with kitchen shears and flatten the chicken. Season it generously with salt and pepper on both sides. Make a paste with the sumac and 2 tablespoons of olive oil, and rub the paste into both sides of the chicken. Refrigerate on a plate—no need to cover—for about 8 hours. Or, if you haven’t planned ahead, just leave the seasoned chicken on the counter while you prepare the onions and bread. Put the onions and the remaining 3 tablespoons of olive oil in a large skillet over medium-high heat. Salt the onions and cook, stirring once in a while, until they are limp and turning gold at the edges, around 9 minutes. Add the garlic and parsley, and cook until fragrant, about 30 seconds. Scrape the onions into a large mixing bowl and add the cubed bread. Toss. Oil a casserole dish large enough to hold the bread in a single layer (I use a 12-inch round terra-cotta dish). Scrape in the bread and onions, and spread them out. Set the chicken on top of the bread and roast for 1 hour. Set the chicken on a cutting board and let it rest for 10 minutes. Scrape the bread out into a big mixing bowl and let it cool for about 5 minutes. Add the cucumbers and tomato, squeeze in the lemon juice, and toss. Check for salt and pepper, and add more lemon juice if you want. Pile the salad onto a platter. Cut the chicken into quarters and arrange it around the salad. It’s ready to serve. Cook's notes: I did not rub the sumac paste under the chicken skin. I will do it next time. I did marinate the chicken for 8 hours. This may be why it was so successful for me. I don't think you'd get the same flavor from a short marinade time. I stopped into two local bakeries and could not find farm bread or pane de casa so I used a combination of ciabatta and bakery made whole wheat, it worked well. Do NOT salt the onions while they are cooking! This will make them release their juices and they will never brown. Salt them AFTER they have turned golden brown. Make sure you buy LARGE onions. You'll want a lot as they really add to the dish. I used grape tomatoes and halved them. I baked this in a 4 qt. (9x13x2) roasting pan.